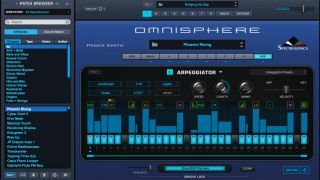 The freshly minted Omnisphere 2.6 sees Spectrasonics building on the hardware synth integration that landed in version 2.5. There’s also a revamped arpeggiator, along with new sounds. To recap, Omnisphere 2.5’s hardware synth integration enables you to use a range of classic synths to control Omnisphere. A selection of new profiles has been added in version 2.6 (see below for the full list), bringing the total to more than 60. The arpeggiator, meanwhile, gets new creative tools, a new preset library and more. You can also capture the MIDI data of the arpeggiator’s current state and drag it into your DAW so that it can be tweaked to perfection. Finally, those new sounds: these feature in the expanded Hardware Library, and take inspiration from Spectrasonics’ Eric Persing’s sound design work on instruments such as the Roland D-50. The Omnisphere 2.6 update is available now as a free update via the Spectrasonics website.